Over the past weeks the board of automotive supplier Continental has reoriented its long-term strategy. Acknowledging that automated driving will be a key element in the mobility of the future the board has outlined a path to fully automated driving and created an “Advanced driver assistance systems” business unit. Continental already has more than 1000 specialists working on automated driving technology. By 2016 Continental plans to have driver assistance systems in production that can operate on freeways in stop&go situation (below 30 km/h). 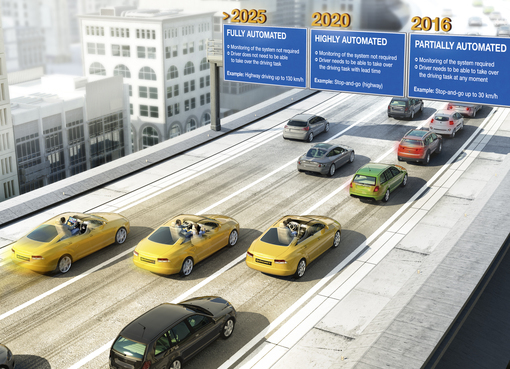 By 2020, they will make highly automated driving possible – i.e. autonomous operation on freeways up to 130 km/h. This should fit well with the time frame outlined earlier last year by the Japanese government for enabling autonomous driving on Japanese highways. Continental then plans to provide more fully automated driverless technology by 2025, but still envisions automated driving as being restricted to the freeway. It is hard to see the difference between their highly and ‘fully’ automated driving in their scenarios. Two days after this announcement, Continental became the first automotive supplier to receive a test license for autonomous driving in Nevada. Their test car has already driven more than 24000 km apparently on highways and in stop-and-go traffic. The car is equipped with current, production-grade sensors and is able to operate without the costly LIDAR system used by most other autonomous vehicles. This new strategic focus by Continental is an indication of the fundamental shift which is currently gaining momentum in the automotive industry. Within the next two to three years we expect to see the auto makers acknowledge and come to understand the full implications of this trend.